The Jungle Theater opened Lady Day at Emerson's Bar and Grill this past weekend, and it was a smashing success. The play with music is the second to last show in their season and features a phenomenal lead and stellar band. 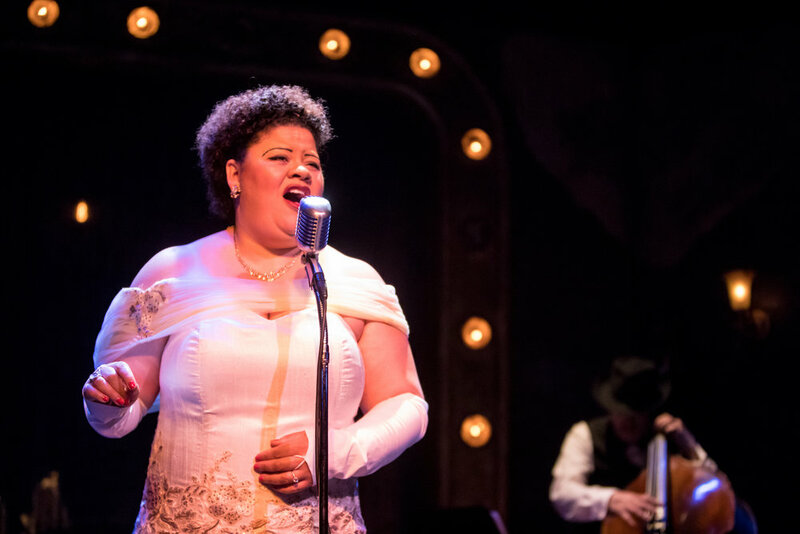 It tells the story of Billie Holiday, a jazz singer who's career spanned nearly 30 years until her ultimate death in 1959. The show is set in a tiny bar in Philadelphia, PA where Holiday puts on a show that would be one of her last. The show begins with the band playing as Holiday walks in from the house, onto the stage. 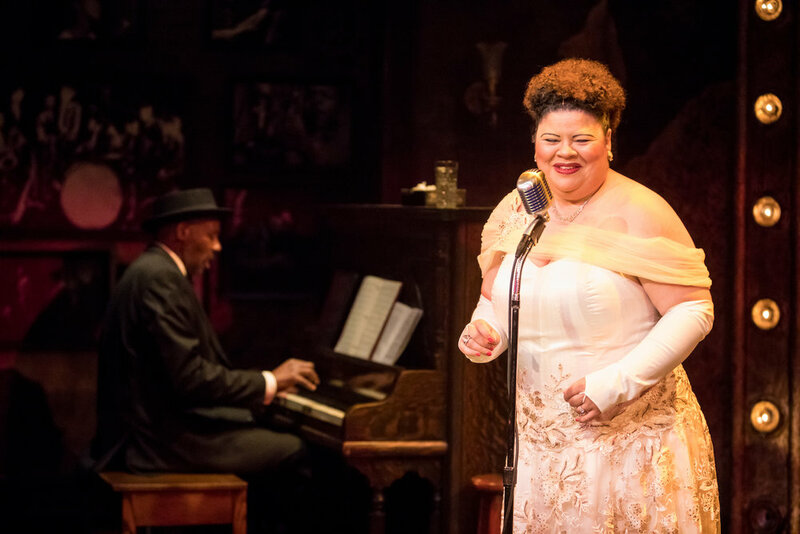 As she enters, the autobiographical show begins with Holiday singing a variety of jazz intertwined through a series of monologues about her life. Holiday speaks about her life, her mother, her previous marriages and the racism she encountered through her life and career. As the show progresses, she slows down tremendously as her addictions have finally caught up to her. At one point during the second act, you could barely understand her as she swayed and slurred her way through a story. While the show was previously on Off-Broadway, it really gained a following and more recognition in 2014 when it opened on Broadway. The production starred Audra McDonald which she received her sixth Tony Award for Best Actress in a Play. The Tony was an especially historic win for her and the Broadway community as she became the only person to win all four acting categories. I remember that Tony award show well, her thank you acceptance speech remains to this day to be one of my favorite ones. I often YouTube it...don't judge. The set is designed by Joel Sass and is pretty beautiful. This being only my second Jungle show (previously The Nether) it was really fantastic seeing it transform. The stage (along with the help of the script) transports the audience to the club. A variety of pictures hang in the hallways, resembling previous performers who had performed there before. Before Billie begins to sing, she crosses the stage and goes to her dressing room, previously unseen by the audience. As she walks into it, a sheer black lace curtain gets back lit to reveal her dressing room. We see her getting ready and pouring herself a drink. A back lit curtain reveal has always been one of my favorite "theater tricks" around. Now to our leading lady, Thomasina Petrus. I've heard of her before and seen her at other theater events, however I had never seen Petrus perform. You could almost say I still haven't seen her perform...because it was Billie Holiday I saw last week on stage, not Petrus. She was utter perfection. Petrus voice is so brilliantly formed to sound just like Holiday while still managing to give her own twist as an actress. At the end of the show, she even sang a tune or two in her own voice and that was remarkable too! The control she has is unbelievable and Petrus has mastered it gracefully. Petrus has played the role before. This is actually her third time playing it (2008 at Park Square Theatre and 2004 at the Old Arizona Theater) which shows why she's brilliantly perfected this role. Petrus manages to bring the audience through a rollercoaster of life events that Holiday went through. At times, she had the audience laughing so hard they stomped their feet, and at times she had them eating out of her hand while she spoke of tragic memories. While the production itself was a 10 out of 10, I will say I wasn't a fan of the actual script. I felt it was too straight forward and often disconnected from a linear story line with Holiday speaking about memory to memory. To me, there wasn't a through story line to follow as Holiday just spoke from story to story. Unfortunately that is the trick to an autobiographical show told by the person it was written about. It's a mystery that not a lot of plays have yet to crack. The production is still a divine play to see and Petrus' performance is one for the ages. It'll be a production that people will be saying "Do you remember her in Lady Day at the Jungle?" years from now. 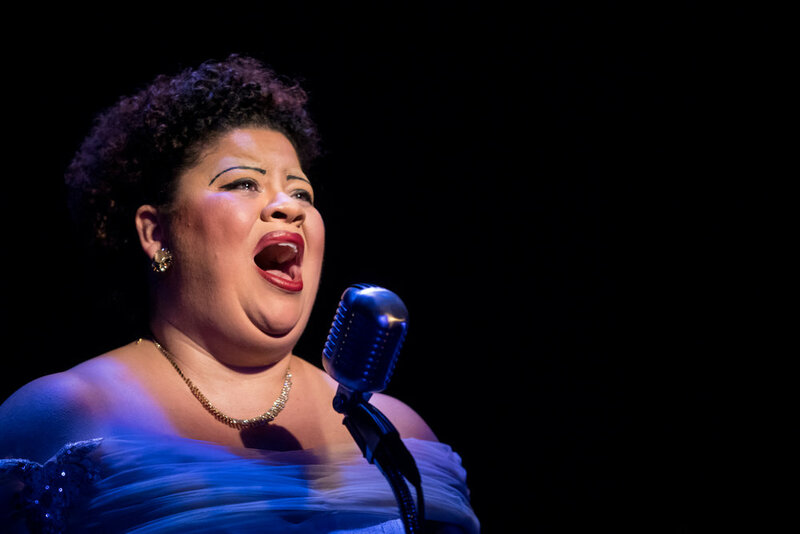 Lady Day at Emerson Bar and Grill plays at the Jungle Theater through June 24. It has a run time of an hour and 50 minutes with a 15 minute intermission. Tickets range from $37-47 with special Friday night pricing. To purchase tickets and to view the Jungle's new season, click the buttons below!